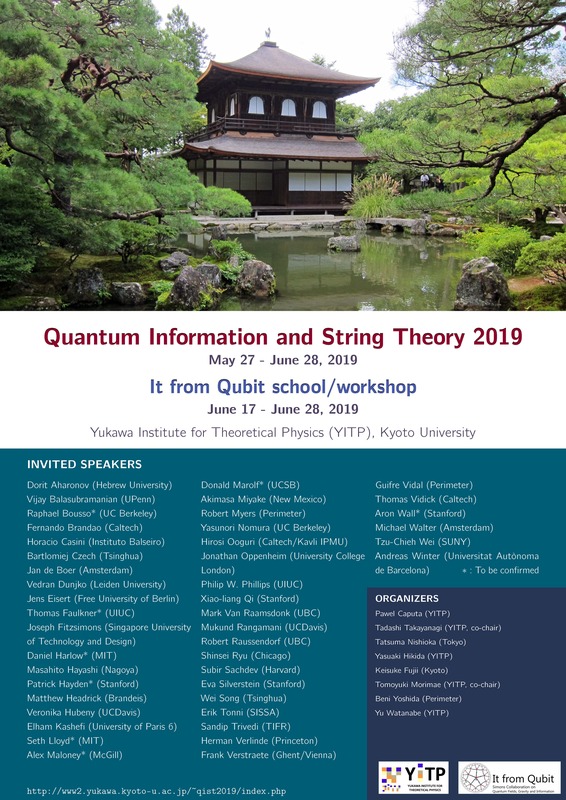 This time, we hold "Quantum Information and String Theory 2019", as a successor of the long-term workshops "Quantum Information in String Theory and Many-body Systems" in 2016. The aim of the workshop is to have comprehensive but intensive discussion on the rapidly expanding frontiers of physics of quantum information and string theory. In the 1st and the 2nd weeks (May 27 - June 7), seminars and talks by the participants will be held. The 3rd week (June 10 - June 14) will be devoted to a conference week with intensive programs. The 4th and the 5th weeks (June 17 - June 21 and June 24 - June 28) will be meant for It from Qubit school and workshop in collaboration with Simons Foundation. During the workshop, participants stay at YITP with desks and other facilities. We hope participants can take ample time for discussions in relaxed atmosphere of Kyoto.